Violinist, composer, and educator Tracy Silverman comes to Rockford next week to perform at the Rockford Area Music Industry or RAMI Awards. He'll also lead a free workshop on his Strum Bowing Method. Silverman is the leading exponent of the six-string electric violin, performing rock, jazz, and more. He's been a member of the Turtle Island String Quartet and premiered works by Terry Reilly and John Adams. But he started in traditional classical music, attending Beloit High School, the Chicago Musical College, and the Julliard School. Guy Stephens spoke with Silverman for this week's Friday Forum. He began by asking: why the change in musical direction? Silverman gave two answers – one personal, the other philosophical. TS: Me and a guy named Mark Wood, who was also building some of the very first six-string electric violins -- and we were the only guys playing them -- basically, we built them together and we had our own rock bands. And we were trying to invent how to play rock on the violin, because we both had this, you know, very clear sort of mission, which was to play, to be rock stars, basically to play on electric violin and have people respond to it. Like they responded to the electric guitar. Rock stars, that was our dream. Apart from that, I read a book at Juilliard that I still own that I borrowed from the Juilliard library and never returned, called The Agony of Modern Music. And it was sort of making this point that all the music in the past was not agony. Even though it was modern. Yes, people were pushing the envelope a little bit here and there. But for the most part, everything that Mozart wrote was in the style of the day and everything that Tchaikovsky wrote was in the style of the day. And I thought, 'Well, if Tchaikovsky were around today, he probably wouldn't write a violin concerto, he'd write an electric guitar concerto, and he'd probably be Jimi Hendrix. And to me, it was pretty clear that anybody who was a serious composer and an interpreter on an instrument needed to live in the present in their own time and place and not be playing music that was several hundred years old, as wonderful as that is. GS: And then it seems as though somewhere along the way, things kind of headed back your way. And I'm talking about with Adams, with the Turtle Island String Quartet, where it seems as though you are going in a direction and some other folks seem to be coming at you in another direction and the result was something new. TS: I just kind of went full circle because, you know, I started in the classical world and veered off into rock and then jazz with Turtle Island, and then Indian music with Terry Riley and then happened to bump into John Adams who was looking for somebody who could play with classical legit chops, but who sounded rocky and jazzy and Indian for this particular piece. So, it was one of those very well-timed fateful moments, but I happened to be in the right time, the right place, and then ended up full circle back on the concert stage --with orchestras -- playing an electric violin concerto. So my parents were very gratified that I'd finally gotten my way back to the classical world. GS: The strum bowing method -- What sets it apart from all those many, many others that have been written right up to today? TS: You know, it's a funny thing. It's not hard to strum a guitar. You can go to your first guitar lesson, and not even know how to play a chord, but you know how to strum it. The point is, it's not that difficult. It's just not the way strings are ever taught. And that's because we are not traditionally parts of a rhythm section. But I spent a lot of time working with the instrument as a chordal rhythm instrument in rock bands and things like that. And in order to play a chord, I realized after doing it for many years that I was doing something with my hand that was basically like strumming a guitar with my bow. It's not what they teach you at Juilliard. Your hand never stops moving down, up, down, up, down up, no matter what the rhythm is. So rather than having to learn complex patterns, it's basically always one thing. It's the common thread in all grooves, a subdivision of the beat. That's what all group music has in common and string players don't ever play it. So I kind of realized that one day and I was like, this is the way to teach all of this stuff. All of those different kind of ways of playing that fiddle players have been doing for many years. But classical players are really not aware of how to use your instrument, as a rhythm, so that people can dance to. GS: So in a way this method is set up so that someone could more naturally go into that eclectic style. GS: You did what you did, and you opened some doors for folks. That meant kind of putting your shoulder to them yourself. But now it seems like a lot more doors are open. Do you have any words of wisdom to the next generation? TS: I like to tell kids when I'm working with young players that, you know, we're better musicians when we know and love a lot of different kinds of music that makes us better players -- just as we're better people when we know and love a lot of different kinds of people. And that's a good thing. That's not a bad thing that you love classical music and you also love Hendrix. And you also love Miles Davis. What I would like to say is that it's so wonderful the work that the RAMIs are doing and supporting, which is all of this education and scholarships for students, because it's the young people who are going to carry this ball down the field. This mission of post-classical string playing, of teaching string players how to rejoin their own contemporary musical culture, is something that kids are very open to and want to learn how to do. And it's very natural for them to want to play the music that they hear all around them. And supporting kids is very central to what I do in my career, what I believe in. So it's always wonderful to see organizations that are making scholarships available and making it easier for kids to stay on their instruments, get better instruments, afford better teachers. My hat's off to them. 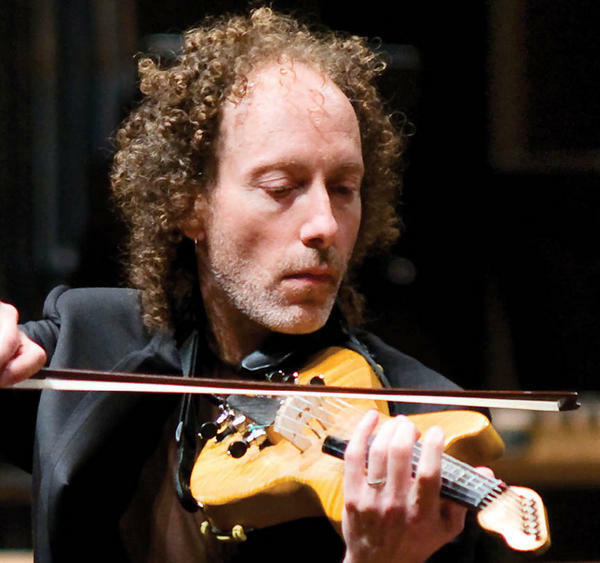 Tracy Silverman brings his electric violin music to the Tebala Event Center next Friday, April 12, for the RAMI Awards, then gives a workshop on his Strum Bowing Method April 13th at Rockford's First Lutheran Church.